The Millennium Biltmore Hotel has been the premier choice for celebrities, presidents and dignitaries for over 85 years. Few Los Angeles hotels boast the ideal locale and sumptuous comforts this luxury hotel has to offer. Situated at the heart of L.A’s vibrant cultural district, the hotel is just steps away from major attractions, such as the Ahmanson Theatre, the Walt Disney Concert Hall and the Dodger Stadium. Just one block away is the quick Metro Red Line subway, which provides easy access to exciting venues like Universal Studios and the Kodak Theater. Just a short drive away you’ll find Hollywood and Beverly Hills, as well as Los Angeles International, Burbank and Long Beach airports. On arriving at the Millennium Biltmore, you’ll find contemporary comforts fused with classic European style in each of the 683 guest rooms. All guests are provided with access to our Roman-style indoor swimming pool and health club, and Executive and Club Level floors feature premium services for discerning travelers. With all this and more, the Millennium Biltmore hotel is an ideal venue for social events, weddings and meetings. Whatever the nature of your stay, a warm welcome awaits you at this luxury hotel in downtown Los Angeles. The Millennium Biltmore Hotel is a renowned Los Angeles, CA hotel known for providing excellent customer service. In fact, few downtown LA hotels offer such a wide range of amenities and services. Whether your stay at the Biltmore is intended for shopping, sightseeing or business, you are encouraged to make full use of our guest services and Fitness Center. If there’s anything that can be done to help, simply ask one of the friendly staff. When looking for a hotel near Staples Center, choose the Millennium Biltmore Hotel. This downtown Los Angeles hotel offers a health club and fitness center for guests who stay active while traveling. Facilities include a steam room, bubbling Jacuzzi™ (under renovation; re-opening fall 2012) and dry sauna, as well as cardiovascular and weight equipment. The indoor Roman-style pool is replete with teakwood deck chairs and cold showers, reminiscent of cruise ships from the 1920’s with its original tile and mosaic work. Men’s and women’s locker rooms with showers are also located inside. The Health Club is complimentary for all guests and accessible by room key only. Health Club open 24 hours; pool open from 6:00am – 10:00pm. This isn’t just the finest Los Angeles accommodations at the Millennium Biltmore Hotel – also on offer are a wide range of facilities for business travelers too. Our business facilities include a self-service business center which is open 24 hours a day, featuring computer stations with internet access, as well as printers, color photocopy and fax machines. All guestrooms offer high-speed internet and wireless access for a nominal fee, and wireless internet is also available in the lobby, Rendezvous Court and Club Lounge. For filming locations Los Angeles is unrivaled, and the Millennium Biltmore Hotel has seen its fair share of feature film, television and music video productions. For decades, the hotel’s stylish combination of elegant interior architecture, varied settings and ability to double as any number of international locations has made it a perfect choice for filming in Los Angeles. An experienced on-site filming manager is available to ensure a smooth experience from start to finish and work with the production team according to their needs. See our website for the California Film Commission, including property photos and further details about our filming location in Los Angeles here. A perfect model of stylish 1920s elegance, the Biltmore’s unparalleled architecture and historic décor provide an exquisite backdrop for Los Angeles conferences, meetings and unforgettable social events. Interiors feature hand-painted and vaulted ceilings, polished wood-paneled walls, magnificent chandeliers and carved friezes, while ballrooms boast unique details such as balconies, columned archways and rich brocade drapery. The hotel can provide 70,000 square feet of flexible banquet and meeting space, which include five ballrooms, nine breakouts, an exhibit hall and executive boardroom. Alongside this, the latest communication and presentation technology including on-site audio / visuals equipment is available. When planning a Los Angeles conference, meeting or social event, you can feel assured that professional and experienced staff are on hand to make everything perfect. When you think of a wedding in Los Angeles you envision glamour, style and luxury, and nowhere is this greater than at the Millennium Biltmore Hotel. The Biltmore has specialized in Los Angeles weddings, receptions, rehearsals and bridal showers for almost 90 years, helping thousands of couples to realize the event of their dreams. The on-site catering manager has been coordinating weddings for over 25 years. He will be with you every step of the way, to ensure your wedding is customized to your exact wishes. You can select from a range of innovative and diverse menus created by the Biltmore’s world-class culinary staff, and enjoy stylish displays of meticulously prepared cuisine. Serviced by a courteous and professional banquet staff, the Biltmore ensures your wedding in Los Angeles will run smoothly. Whether hosting an intimate or grand affair in Los Angeles, the Biltmore has a flexible and extraordinary setting to accommodate every need. The famous Crystal Ballroom, the legendary spot of the founding of the Academy Awards in 1927, features a hand-painted 30-foot ceiling, carved columns, glittering mirrors and lush drapery. The second-story balconies surrounding the ballroom offer a magical setting to overlook the entire scene, while dazzling Austrian crystal chandeliers and shimmering wall sconces highlight table settings and flower arrangements with an enchanting, romantic glow. To simplify the planning process of your wedding reception, the Millennium Biltmore Hotel Los Angles offers three-course and four-course all-inclusive wedding packages, while customized menus are a welcome request. For wedding events with special dietary requirements, the Biltmore invites outside caterers Sunday through Friday for your convenience. Swank AV, our in-house audio/visual company, is always available for all sound and lighting needs, while outside vendors are also acceptable. The hotal can also host your engagement luncheon, bridal shower or rehearsal dinner in one of our fantastic Los Angeles venues. From elegant Afternoon Teas for the girls to an intimate family dinner or celebration with friends, the restaurant and smaller event spaces are perfect for groups of all sizes. Special rates for wedding guests staying overnight in Los Angeles are available by contacting our Sales Team at +1 213 612 1500. For more information or for a complimentary information kit with all package details and pricing, please contact Valerie Lehman in our Catering Department at +1 213 612 1529. 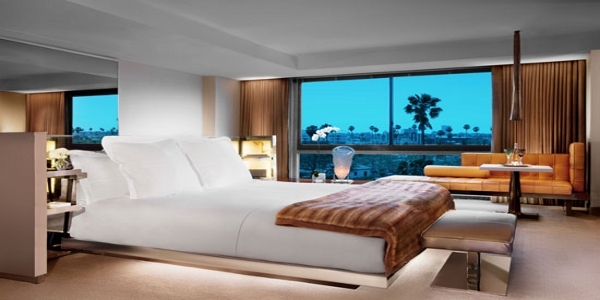 These Los Angeles hotel rooms are clean, spacious and abundant in contemporary comforts. All of the accommodations are equipped with a number of thoughtful provisions, so that business and leisure travelers can make the most of their stay here. 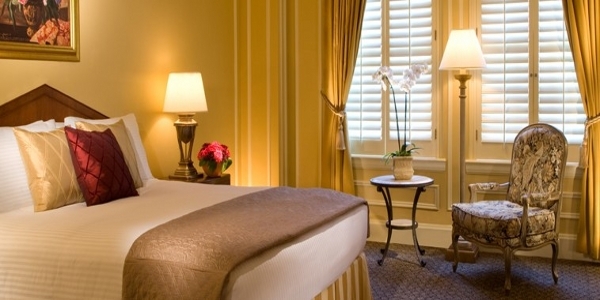 All rooms reflect the unique history and heritage of the Biltmore hotel, with each boasting fine furnishings and a warm, comforting color scheme. When it comes to Los Angeles hotel rooms, the Millennium Biltmore Hotel offers nothing but luxury. That’s why the Standard Room accommodations are anything but standard, with each featuring a rich, warm color scheme and luxurious marble bathroom. Each is of a distinct size and shape, reflecting the unique heritage and history of the Millennium Biltmore Hotel. 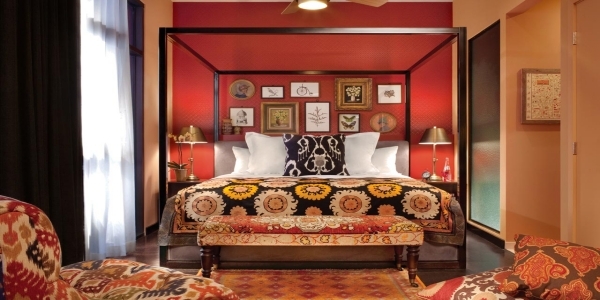 Ranging from 250-500 square feet, each room is equipped with a variety of thoughtful features. Accommodations on executive floors are based on availability, and floors 8 and 9 offer upgraded room configuration. Additional amenities are also included, specifically designed with the business traveler in mind. These include a large plasma flat-screen television, mp3-compatible clock radio, wider desk and credenzas bright lighting. The most luxurious Los Angeles accommodations can be found on the exclusive Millennium Club Level. Each of our Club Rooms offers the utmost comfort and opulence, featuring rich color schemes of gold and blue, alongside custom-designed carpets, lush drapery and elegant European bed canopies. Each of these hotel rooms measures 260-525 square feet, and comes with a variety of thoughtful amenities and features. Guests staying in Club Rooms are also offered the comforts of the Club Lounge, which includes a range of complimentary features. Enjoy daily breakfast, afternoon hors d’oeuvres and a computer station with Internet, fax and printing services. The lounge boasts a variety of daily newspapers, personal concierge service and relaxing lounge area with flat-screen televisions. *Please note hotel policy restricts children under the age of 14 from access to the Club Lounge. Two guests per hotel room may use the Lounge at no charge; each additional guest per hotel room will be charged a fee of $25. 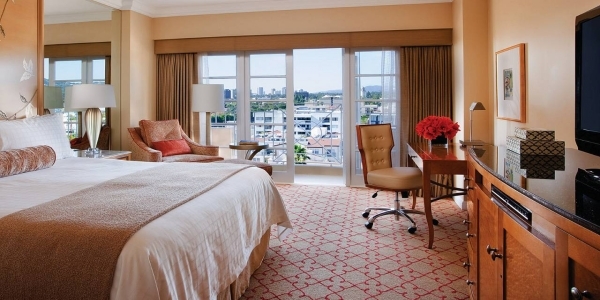 When looking for hotel suites, Los Angeles offers a range of sumptuous offers. The Millennium Biltmore boasts some of the finest in the area, with its Club Suites replete with a range of excellent features. Club One-Bedroom Suites encompass a master bedroom and bathroom, small foyer and large parlor with sofa, armchairs, coffee table and entertainment center. The suite’s dining table offers seating for six or eight and the suite’s square footage ranges from 770-910 sq. feet. All of these Los Angeles hotel suites range from 760-990 sq. feet and include a large sitting area with sofa, armchair and coffee table. Guests staying in Club Suites are also offered access to the Club Lounge, which comes with a range of complimentary features. Enjoy daily breakfast, afternoon hors d’oeuvres and a computer station with Internet, fax and printing services. The lounge boasts a variety of daily newspapers, personal concierge service and relaxing lounge area with flat-screen televisions. *Please note hotel policy restricts children under the age of 14 from access to the Club Lounge. Two guests per room may use the Lounge at no charge; each additional guest per room will be charged a fee of $25. 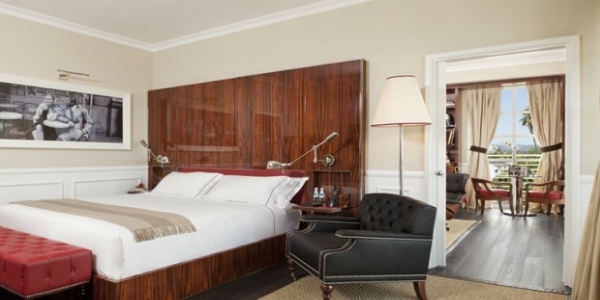 Few Los Angeles suites boast the excellence of the Millennium Biltmore’s Specialty Suites. Offering 27 beautifully-appointed hotel suites of various spatial configurations, each offers all of our regular amenities in addition to having their own unique details and comforts. This 905 sq. foot hotel suite features a separate bedroom, bathroom and parlor complete with large couch, occasional chairs, coffee table, decorative fireplace and dining table. The 600-910 sq. foot Junior Suites feature a sitting area with sofa and armchair, in addition to the master bedroom with bathroom. Some rooms also include vanity areas, so please don’t hesitate to enquire. The spacious two-bedroom Biltmore hotel suite features a large living room, butler’s kitchen, dining area and separate hallway, with bathroom and master bedroom luxuriously appointed. The 930 sq. feet Becker Suite is a luxurious one-bedroom suite, replete with elegant marble foyer and dining table to seat six individuals. The 2,000 sq. feet Music Suite is one of the finest accommodations at the hotel. A beautiful 2-bedroom, 2-bathroom retreat, it boasts views of Pershing Square, a baby grand piano and antique music stand. The living room comes with a flat-panel plasma television and DVD player, and dining table can seat up to 10 guests. The suite also boasts a large reception area and butler’s kitchen. When deciding which downtwon Los Angeles restaurants to eat at, there are many options. Guests of the Millennium Biltmore will enjoy a wide range of dining options at the hotel. We boast some of the best restaurants in Los Angeles, and a diverse range of venues to choose from. Relax with a delicious cocktail in the grandeur of the Gallery Bar, or select an exclusive liqueur from the menu in the Cognac Room. For guests seeking a light bite or a few leisurely drinks, Sai Sai Noodle Bar will provide you with speedy and efficient service. Conversely, Smeraldi’s Restaurant can offer homemade Italian cuisine and a great range of sumptuous steaks. For something lighter, opt for traditional afternoon tea – complete with scones and Devonshire cream – at Rendezvous Court. There are many restaurants in Los Angeles downtown, but Sai Sai Noodle Bar is one of the best. Fast and casual, yet chic and healthy, our trendy noodle bar is proud to serve the Downtown LA community. The simple menu offers appetizers, salads and various types of noodles, encompassing all from the Pho noodle of Vietnam to the Udon and Ramen of Japan. The healthy soup bases are made daily with the freshest ingredients, and desserts are no more sinful. Try the Bubbies Mochi Ice Cream flown in from Hawaii, or simply finish your meal with a local micro brew or California-grown wine. Also on offer is complimentary wifi for customers, and 55″ flat-screen TVs so you catch the latest sport games. The artistic corner allows our inventive customers to paint their own canvases too, which we intend to display as permanent masterpieces! We also offer takeout services for you to enjoy at your own convenience. Restaurants in downtown L.A. don’t get better than Smeraldi’s. Offering casual dining in a bright, relaxing ambiance, and providing a range of homemade Italian and Continental dishes. Open daily, Smeraldi’s highlights include exquisite breakfast buffets, healthy lifestyle options and a chef-attended omelet station in the morning. Also on offer are sumptuous lunch options like seafood, pasta and dessert buffets, and dinner options include delicious and authentic southern Italian steaks, seafood, homemade pastas and more. Whether you fancy a 12oz New York Steak or a Tagliolini Con Lobster Ragu All’Amatriciana, when dining downtown, Smeraldi’s is an exciting prospect. Dining in Los Angeles involves eating delicious, inventive dishes, in often unique and beautiful venues. Rendezvous Court is no exception, having served as the original lobby of the Biltmore when it opened back in 1923. Rendezvous Court is adorned with Moorish carved wood ceilings, gold-leaf accents and Italian travertine stone walls. From its rose marble fountain to the enormous bronze Baroque stairwell, you can’t help but delight in its elegant two-story lounge. The space has even been featured in film and television, including features such as Daredevil, Beverly Hills Cop, The Nutty Professor, 24 and Heroes. Traditional afternoon tea is served Wednesday through Sunday from 2:00pm – 5:00pm. Guests can choose from the $29 Victorian Tea, which includes a pot of tea from our selection of finely-blended custom teas, an assortment of elegant tea sandwiches, our famous freshly-baked scones with homemade Devonshire cream and jam and a selection of miniature pastries. For $33 you can indulge by adding a glass of Sherry, Kir or sparkling wine ($46 with Laurent Perrier champagne). Another option is the simple yet elegant $24 Princess Tea, which offers a pot of tea, freshly-baked scones with Devonshire cream and jam and assortment of miniature pastries. Tax and gratuity are additional. Café Rendezvous offers fresh espresso, cappuccino and coffee drinks, freshly-baked pastries, fresh fruit and yogurt, plus cocktails, bottled water and juices. Open daily from 6:00am – 6:00pm. A light menu featuring salads, sandwiches and signature dishes is available Wednesday – Sunday afternoons from 2:00pm – 6:00pm. Few bars in Los Angeles enjoy the fame of the Biltmore’s Gallery Bar. It has long been considered one of the best hotel bars in downtown Los Angeles, because its long list of signature martinis, fine wines and exclusive liqueurs come under the watchful eyes of gracefully carved angels, found above the polished granite bar. Another proud feature is the famous “Manhattan Menu”, a list of 6 unique versions of this popular and nostalgic drink. Sip your delicious choice of cocktail along one of the secluded leather banquettes, or retire to the adjacent Cognac Room with its soft couches and wooden cabinets, filled with Biltmore memorabilia. The menu includes a variety of wonderful dishes, such as the 1920’s-style Shrimp Cocktail served in original hotel silver, or the hotel’s delicious flatbreads with homemade toppings. Whether it’s burgers, salads or sliders you fancy, food is served from 4:00pm – 11:00pm daily. The Gallery Bar isn’t lacking in entertainment either, as every Friday and Saturday night you can enjoy jazz, blues, standards, rock and more with Ryan Cross and his guest artists, live from 8:30pm.